It’s time for the 2012 Silver Dollar Ball! Have you purchased your tickets yet?! Click here to get your tickets for this event hosted by Chip & Mardi Ferrier at XO Ranch in Aubrey, TX this Saturday, May 12, 2012. 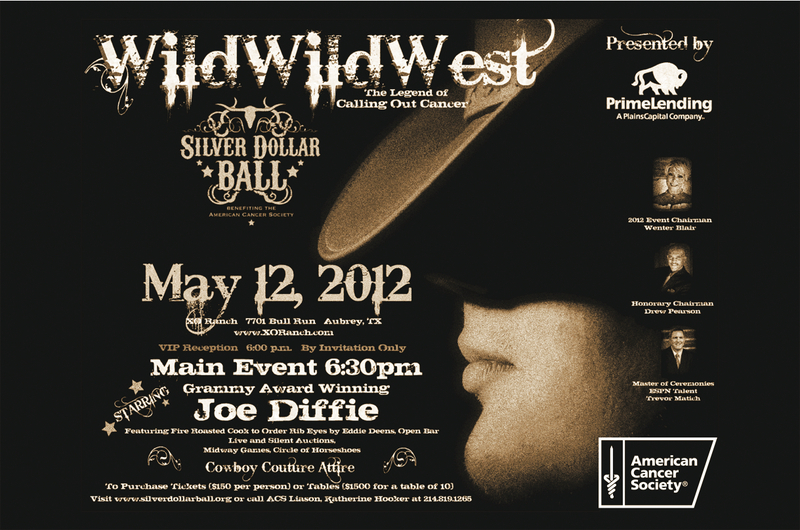 The theme this year is Wild, Wild West – The Legend of Calling Out Cancer. Come meet and greet event honorary chairman Drew Pearson and celebrity emcee Trevor Matich at this event benefiting the American Cancer Society. Shop the silent and live auctions, ride the mechanical bull and enjoy country music entertainment by Joe Diffie while supporting an organization whose mission is to eliminate cancer. This is one “party in the pasture” you don’t want to miss! I have purchased my first pair of cowboy boots and hope to see you at the party! The money raised by the Silver Dollar Ball will benefit the American Cancer Society and will help fund research, education, advocacy and service programs that benefit cancer patients and their families throughout North Texas. In Collin, Denton, and Dallas counties alone, 13,133 people will be diagnosed with cancer this year and of that, 4,747 are expected to die from the disease. The American Cancer Society is the nationwide community-based voluntary health organization dedicated to eliminating cancer as a major health problem by preventing cancer, saving lives, and diminishing suffering from cancer. For more information on the Silver Dollar Ball, please visit www.silverdollarball.org.